What the world needs is some serious KINDness. Okay, that doesn't seem realistic - but you could pick up KIND at your local convenience store! We are looking for a fast way to get our nutrients. And, since, we don't have our own private chefs, we rely on packaged snacks. My old favorites are Lara Bar and Chunks of Energy. KIND bars are nutritionally dense, with no refined sugar and the right combination of natural protein, carbs and healthy fats so you won’t get hungry or snack on junk! Just like Lara Bar, they are a bunch of good stuff like macadamias, mango pieces, honey, almonds, apricot pieces, etc. mushed together and they taste great! They are using the naturally occurring sugars in the dried fruit and honey to make them sweet and the natural fats in the nuts to make them taste good. So, basically, you have a packaged mix of fruits and nuts (oh and they add vitamins - which is fine - but I'm not sure it is helpful). They are gluten free, wheat free, dairy free, non-GMO, and free of sulphur dioxide (which can be added to dried fruit). They remind me of Mary's Gone Crackers but they are sweet. The people at KIND are funding snack research. They are trying to answer a question that has been bugging me. If you eat a healthy snack instead of a junk food snack will you lose weight? The hypothesis would be that your body, since it got some needed nutrients, would want to eat less if it had a healthy snack. Dr. David L. Katz, Director of Yale’s Prevention Research Center, did a study with 94 overweight adults and found that two daily KIND Fruit and Nut bars, were associated with neither weight loss nor gain. If he had found that the adults had LOST weight, he would have proven that nutrient dense snacks help you lose weight. What he found was that if you add them to your diet, you might not gain weight. KIND bars are about $1.65 each, so they are not cheap. I found them at my neighborhood convenience store, and on Amazon. IF you could just eat 1/2 of one, you would have a great replacement for a cookie or Doughnut because you would keep it at 100 calories. Perhaps, you could buy them, cut them in half and then bring them with you. Hey, KIND, how about a 100 calorie KIND bar? Just make them smaller! My kids really liked them, and I think they make a great treat for them. Anything packaged is a treat because it costs so much more than an apple. Cheerios: A Good Choice For a Healthy Snack? 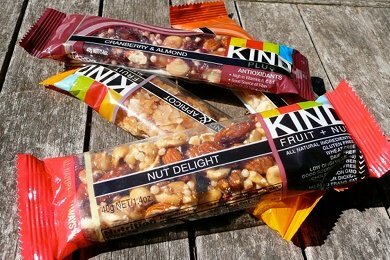 I love Kind bars and I'd love a 100 calorie version. My favorite is the almond and coconut one and it is also one of the lowest in calories. I cannot spend 220 calories on a bar for a snack. But 170 calories is acceptable as a treat. I eat them when I need something on the go and I forgot a snack. I'll grab one at convenience stores- they're less processed than Clif bars and more readily available in stores than Larabars (at least around my area). I love these - they rank right up there with Lara bars. Gluten-free and full of REAL food. 100 calorie version would be terrific! 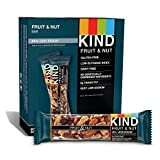 SnackAisle.com carries 10 different flavors of KIND bars, now all in 12 bars/box - and ON SALE now! I've picked up a Kind bar so many times and always put it back. Like you, I want my energy bar to be lower in calories. I saw this post and went ahead and ordered a box of 8 of them on Amazon. My wife and I just tried them when they showed up at our door and we both agreed they are great! I wish they were closer to 100 calories, but they taste great and I don't have to feel bad about eating one of these as a mid-afternoon snack! Thanks! KIND bars are so good. My favorite is the Fruit and Nut Delight. It's 180 calories which is quite a lot so I don't eat them very often. I tried cutting them in half, but always go back and eat it later! I saw these at my Safeway store for $1.25 each, so definitely not cheap! I am a health coach for people with diabetes and I LOVE Kind bars! Natural ingredients, high in protein and fiber and low in carbs! The Nut Delight and the Almond, Walnut, Macadamia PLUS Protein are the lowest in carbs and highest in protein. I do WISH they would leave out the honey and sugar and try one with STEVIA... to go as low carb as possible. I do not even look at calories... just carbs, fiber, protein and healthy fats! The more satiated you are, the less you will eat later on... so less calories follow reduced hunger. They do make a "mini version" for about 115 calories. I found them on drugstore.com and amazon.com.